Sleepless nights come with the territory in college. Pulling all-nighters becomes a point of pride to some students as they brew coffee at 3 A.M., pull out their secret stash of chocolate and gummy bears, and dig into their work to show that no matter how late it is, they’re committed to getting it done. Or maybe, with less work to do, they stay out all night socializing with friends, eating cheeseburgers and fries at a 24-hour restaurant, and discussing the latest news and gossip around campus. Either scenario can leave students showing up to class the next morning bleary-eyed and nodding off. College students’ sleep habits have been well documented; a recent study reported that 70 percent of college students are not getting enough sleep. Sleep deprivation has some real and serious consequences. While an occasional all-nighter probably won’t do irreparable harm, if college students start establishing poor sleep habits, they could set themselves up for adverse health consequences during college and down the road, including heart disease, high blood pressure, diabetes, obesity, and declining mental health. To help students establish healthier sleeping habits, Geoff Ginsburg and Susanne Haga from the Center for Applied Genomics and Precision Medicine have partnered with the Office of the Provost, the School of Medicine, Duke Health System and private donors as part of a Together Duke research collaboratory to establish the Duke University Precision Health and Wellness Initiative, also known as “WearDuke.” The goal of this initiative is to use digital health wearable devices to promote health awareness and engagement among Duke undergraduates. The wearable device market has exploded in recent years. Millions of people are tracking their steps, heart rate, sleep and more to make informed decisions about their health. WearDuke wants to use that technology and the excitement surrounding it to get incoming freshmen interested in learning about the importance of sleep on their physical and mental health and academic achievement. Freshman participating in WearDuke will measure and track their activity and sleep patterns through wearables. They will be asked to complete short surveys each week and more detailed surveys at the beginning and end of each semester to gather information about factors known to impact sleep as well as their health and academic performance. Students will be able to establish sleep goals and access tips for getting an appropriate amount of sleep. They will also have the opportunity to learn about the risks associated with unhealthy behavior and discover ways to mitigate those risks. The first year of this initiative is the planning phase. 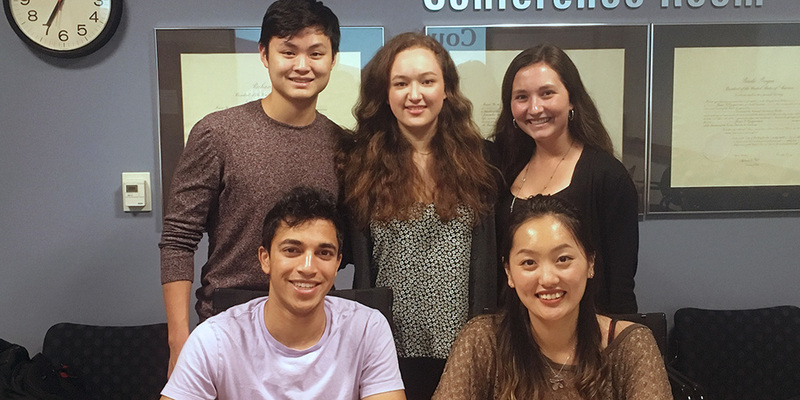 Currently, a team of five undergraduate students, supported by the Enabling Precision Health and Medicine Bass Connections project team is developing the infrastructure needed to launch WearDuke. They have also begun to gather student feedback about the initiative by speaking to members of the WearDuke Student Advisory Council and by holding focus groups with undergraduates. “So far, students are excited about the possibility of freshmen receiving wearables,” team leader Sarah Bond said. “Several students have said they wish this initiative had been going on when they were freshmen.” The Bass Connections team is also working to develop a companion app, website, and recruitment and incentive strategies. Once the planning phase is complete, WearDuke will conduct two pilot studies with small groups of freshmen before launching the initiative to the entire freshman class in the fall of 2021. While the current project only focuses on sleep, this initiative has the capability of expanding to other health-related behaviors that can be easily monitored through wearables, like diet and activity, which the team hopes to incorporate in coming years. Even though all-nighters will probably still happen during mid-terms and finals weeks, with greater awareness of their sleep habits over time, hopefully students can achieve a routine of good sleep quality and quantity and understand the benefits of doing so now and in the future.